Syn-Apps' notification software is compatible with a variety of industry-leading IP hardware manufacturers - unifying software and hardware across your network for a truly streamlined communication experience. Fully integrating notification software with IP devices, such as speakers, clocks, and strobes, provides customers paging and alerting functionality with reduced hardware and cable costs by leveraging existing network infrastructure. The following manufacturers provide PoE-enabled VoIP devices, providing plug-and-play integration for customers. Clock kits are enclosures that allow you to upgrade your IP devices to display digital time and wall mounting, providing consistent and accurate time across your campus or organization. 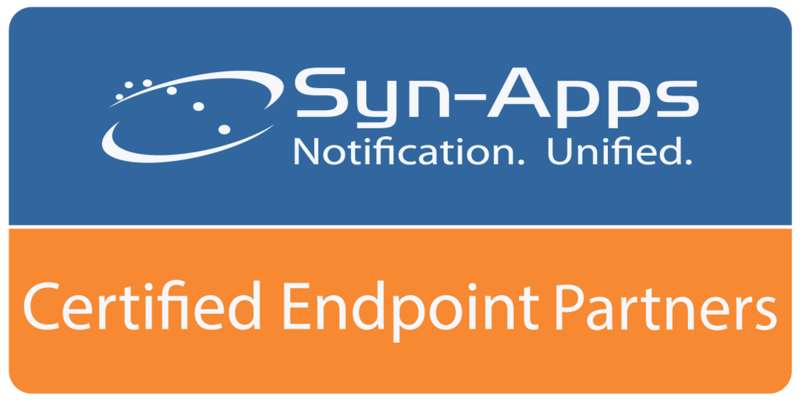 Syn-Apps' Certified Endpoint Program is designed to make interoperability more readily accessible to manufactures, customers, and channel resellers alike by creating new network-enabled notification endpoints leveraging Syn-Apps’ royalty-free, open API. The program helps to facilitate innovation and growth between Syn-Apps and IoT hardware manufacturers, provides mutual customers with freedom of choice, while furthering our global footprint. IoT manufacturers participate in the program by integrating Syn-Apps’ API and testing their hardware for interoperability with Syn-Apps' notification software solutions. Use of the API is free of charge to IoT endpoint manufactures and carries a small fee for mass notification providers that integrate Syn-Apps’ API into their own solutions, allowing them to leverage the growing ecosystem of Syn-Apps’ certified IoT devices. Our Endpoint Partners are actively working to test and certify their devices.